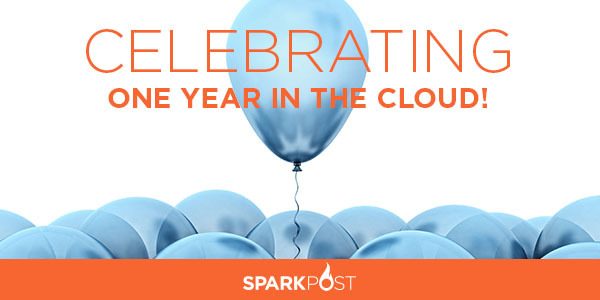 SparkPost is turning one year old. We launched with the mission to bring the benefits of a modern cloud architecture to email sending—and a focus on being simply the best email platform for developers who need a programmatic web service for email. It’s a special feeling to realize we’ve hit the one year mark, and we truly are gratified and humbled by the response our SparkPost platform has received in the market. In our first year, we made incredible progress building a truly scalable and high-performing cloud email platform—but more than that, we are amazed and thankful for all the great developers that trust their apps and businesses to us. If you’re a long-time email pro, you might know that SparkPost came out of Message Systems, the leading provider of on-premises email technology. Our Momentum MTA (Message Transfer Agent) platform powers 25% of the world’s legitimate email for senders like Twitter, LinkedIn, Salesforce, and many other great companies. We’re proud of that heritage and the essential role we play in these tech giants’ own technology stacks. But, we also knew that there are many more companies—large and not-so-large—that wanted that same performance in a way that is native to the cloud. And we knew that simply moving an on-prem stack into a data center and calling it “cloud” wasn’t the way to do it. So, when we built SparkPost, we re-architected core code and ops components to take full advantage of what the cloud offers—and leave behind the limitations that come from the traditional data center model. SparkPost is truly and fully a cloud native offering, existing within AWS and benefiting in countless ways from what the cloud makes possible. For example, when our customers need to scale or burst suddenly, our systems can automatically and immediately start adding capacity for the time it is needed. This elasticity allows us to offer the highest-performing email delivery platform on the planet—and deliver amazing value. It’s also why we can offer SLAs that our competitors can’t match; they’re still racking new boxes when they need to scale. After our first year, SparkPost sends 6 billion emails per month for companies that range from garage app developers to global brands like Pinterest, Zillow, and CareerBuilder. But, across the board, we are committed to continue building the best email platform that fully leverages the cloud to offer the most to our customers’ businesses. We’re also honored by the community that has developed around our platform. To the developers that have extended our platform with your own innovative SDKs and libraries, we say thank you. We are amazed by your innovative work. We are listening to you, and we work every day to make sure you have the the world’s most reliable and innovative email platform, period. Thank you for being a big part of our success. We quite literally would not be here without you. I can’t wait to see what we can build together over this next year and beyond.